CHP systems, also known as cogeneration, generate electricity and useful thermal energy in a single integrated system. CHP is not a technology but a way to deploy existing technologies. 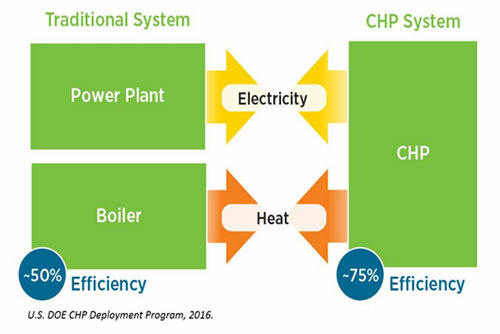 Heat that is normally wasted in conventional power generation is recovered as useful energy, so CHP systems are more efficient and provide environmental, economic, and energy system infrastructure benefits. However several barriers impede cost-effective CHP applications, including lack of common interconnection protocols, confusing and sometimes excessive standby rates, and emissions regulations that do not recognize the improved efficiency of CHP systems. Traditionally, electricity is generated at a central power plant, and onsite heating and cooling equipment are used to meet non-electric energy requirements. In a CHP system, the electricity is produced on site, and the thermal energy is recovered and used for heating or cooling a nearby building, or for industrial processes. Because CHP makes use of what would otherwise be wasted, the efficiency of these integrated systems is much greater than that of traditional separate systems. For example, the CHP system in the figure has an efficiency of 75%, while the separate systems have a combined efficiency of only 50%. CHP also avoids transmission and distribution losses (typically 7%) since power is produced on site. CHP is widely used in industrial manufacturing facilities and at large institutional sites such as campuses and universities. In recent years, smaller CHP systems have increasingly been installed in commercial buildings with continuous thermal loads, such as hospitals and multifamily buildings. A recent DOE report estimates that more than 240 GW of technical potential for CHP currently exists at over 291,000 sites within the United States. Although CHP technologies have improved in recent years and systems have become cost effective in many applications, a number of hurdles remain that limit widespread deployment. Less efficient conventional methods of producing heat and power still predominate. Federal assistance and voluntary standards for state consideration are needed to overcome barriers to greater CHP deployment. Addressing many of these barriers, the HEAT Act will improve business competitiveness, enhance U.S. energy security, and reduce pollution by making efficient use of heat recovery technologies. Interconnection is the process of connecting a CHP system, or any distributed energy resource, to the transmission or distribution grid. A lack of national business practice standards for the interconnection of CHP has resulted in a patchwork of regulatory models that vary from state to state. Some utilities require complex, costly studies and the installation of unnecessary and expensive equipment, which discourages CHP. The HEAT Act addresses this barrier by directing DOE to develop a standard set of interconnection procedures and associated fees in consultation with the Federal Energy Regulatory Commission (FERC). These procedures will reflect current best practices to encourage the use of CHP and WHP while also ensuring the safety and reliability of the distribution and transmission networks. The model standards are voluntary; states are not required to adopt them. Standby rates are charges paid by customers who operate onsite generation systems (such as CHP) for services from an electric utility, typically including access to supplemental, standby, and backup power. Many of the prevailing tariff structures are confusing and some of them are excessive, which creates a disincentive to invest in CHP. The State and Local Energy Efficiency Action Network’s Guide to Successful Implementation of State Combined Heat and Power Policies identifies key features that should be considered in the design of standby rates. The HEAT Act addresses the standby rates barrier by directing DOE and FERC to establish model rules and procedures for determining supplemental, backup, and standby power fees for CHP and WHP systems that allow for adequate cost recovery by utilities. The model rules are voluntary; states are not required to adopt them. CHP uses less fuel input compared to conventional generation and leads to lower emissions of pollutants. However a variety of emissions regulations do not recognize the improved efficiency and pollution benefits of CHP systems. Electricity generation technologies, including CHP, have traditionally been subject to input-based emissions regulations, which define limits on the amount of emissions that can be produced per unit of fuel input (e.g., pounds of SO2per million Btu of coal). The alternative is output-based emissions regulations, which define emissions limits based on the amount of pollution produced per unit of useful output (e.g., pounds of SO2 per MWh hour of electricity). Unlike input-based standards, output-based emissions standards recognize both the efficiency and pollution prevention benefits of CHP and other distributed generation systems. EPA provides guidance on the implementation of output-based air regulations, but so far less than half the states have adopted this regulatory approach. The HEAT Act directs EPA to create a voluntary grant program to help states update local air permitting procedures to incorporate output-based standards.